If you still use our old countdown websites to check on live bus arrivals, you’ll notice a change from June 1 as you’ll be redirected to the main TfL website instead. Instead, you’ll be able to check for live bus information on the TfL home page, using the new favourites feature to get live arrivals for your stops. We currently operate two services for our customers to view live bus arrivals, tfl.gov.uk and countdown.gov.uk. The service at countdown.tfl.gov.uk is now at the end of its life and it is not economic to maintain it in future. We recently introduced favourites feature on our website, as described in my previous post. These features allow you to save your bus stops and get live arrival information. How can I get live arrivals for frequently used stops? When you visit our website you’ll notice a star on the top right corner. Click or tap on it and search for your most frequently used bus stops. You can then add these to the favourites panel and get live arrivals. Having set these favourites, you’ll also find your saved bus stops on the home page along with the live arrivals. The image above shows this process. Alternatively, you can bookmark bus stop pages for future reference. We realise that this new functionality replaces a well established service and we are working on improving the experience further. We’re really interested to get your feedback to help us better understand your needs. It would be great to know any thoughts you have or problems you’ve faced by leaving us a comment below. I’m going to miss the old m.countdown site. It does exactly what you need when it’s late at night, you’re a little intoxicated and your phone’s signal is being flaky. 9. An “add to favourites” link. That’s all that fits on the screen of my phone, and I have quite a large screen compared to other phones. Another thing I’ll miss about the old site is how it behaves on poor network connections. I rarely have WiFi or a wired connection when I’m waiting for the bus, so I’m at the mercy of mobile networks. The old site rendered all the arrival times server side, so I was only ever waiting for a single page to load. And if I refreshed the page, my browser continued to display the old times until the new page loaded. Your new site loads the critical components of the page over ajax, meaning I have to be lucky enough for multiple requests to succeed before I get to see what I want. Also, I’ve found your ajax requests don’t always have the best of error handling, so I’m occasionally left looking at a fancy loading spinner indefinitely. I know you’re trying to step forward here and I don’t mean to sound like a luddite. In fact, I’d love to see the bus times pages become an offline-first progressively enhanced web app using tools like Service Worker. But failing that, my second preference is a server-side rendered page with minimal styling, just like m.countdown gives me today. Hi Luke, appreciate you feedback. From your comments, I realise you land on the bus stop page directly for live arrivals. Perhaps you might try saving the bus stops with your preferred routes by adding them to your favourites. It will become easier for you to get live arrivals. Once saved, you will also get live arrivals on the home page. Hopefully it makes your experience better after you try this. That’s quite interesting feedback! Considering every journey matters for us, we would definitely look into your feedback. As an update we are working on improving nearby feature which will make your experience better. I’m presuming this only affects people who use the website for information thus those of us who use the android apps such as Bus Countdown will still get information directly from our installed app without visiting TFL’s website. I would really appreciate some feedback thanks Irene. irene, you should get information directly from your installed app as this does not affect installed apps. my understanding is that those apps like Bus Countdown should be getting the information from the same source. Hi Irene, yes it wouldn’t affect the android apps that you use. The nice thing about the old website was it took about 10 seconds to find buses nearby regardless of where you were. It would be great to have this on the new site as it seems to take an age to go through the website and then find a bus stop the new way – I use lots of random bus stops so the favourites doesn’t work so well for me. m.countdown was a perfect cut-down version only showing what was needed. no fancy graphics, just simple text with information about when the next bus is. So much useless information is now loaded when going to the new link. When the page loads, you have the top toolbar. The next section is a link to the bus stop you want. Then the name of the bus stop, then the bus stop letter and where it is going to. You then have a google map – I don’t understand why this needs to be there. Then Live arrivals and the time – I already know the time. Pointless. Next it lists all the bus and you can select which bus – This is okay. Next linee is “For arrival times of next bus, text…….. – You do know the information is already displayed. Why do I care about texting. Next is about first and last services. This is not really needed for LIVE BUS TIMES. Then I can plan a journey. Why? I am already at the bus stop. Next is the longest footer ever. Just like this post, there is too much information which is just not needed. Then links to the MAYOR OF LONDON rubbish. How hard is it to provide a simple interface with simple information? Hi Kareem, thanks for your feedback. I was wondering if you tried adding your bus stops as favourites. If you try that, you will get live arrivals in the new favourites panel and on the home page. In this case, you would only see live arrivals for your preferred bus stops and all other information would be filtered out. Hopefully that would improve your experience. The absolutely hit the nail on the head, Kareem. Having to scroll past ad & mini-map of a stop I use every day & current time and then the footer message about SMS to find out stop times.. all really daft. It’s such a “design by committee” page – I cannot believe there’s no cut-down that’s practically text only. This doesn’t seem a change is for the better, however required it may be. The mobile user interface has gone from one functional concise page to a myriad of options that require more scrolling and selecting. Mainly due to font size and design…..
– Search function does not also say ‘Bus Stop Code’ (surely the main identifier). – I have 7 favourite stops that were easily seen listed. To get to the one at the bottom, I now have to scroll through all the others bus times (as a Londoner who is looking for the faster route on my 90min commute, I prefer to see all buses at all my stops). – A/ Go to Web Page B/ Select Favourites C/ Scroll to Favourite if not at top D/ Select stop to see Buses arriving in time order. PREVIOUSLY A/ Go to Web Page B/ Select stop to see Buses arriving in time order. – Now you don’t need qualifications in design or user experience to figure out the slicker workflow, whatever platform it’s built on. – And of course there is all the other website material on the Web Page, including Advert on how to vote. – Countdown was fantastically simple. Having it incorporated into the TFL website has made it bloated. Dear developers. Please please PLEASE continue the m.countdown and accessible.countdown sites. Or create a new stripped down version. This new link crashes on my non smartphone. It was perfect, speedy, and worked on non 3G. My phone won’t load the new version. This CANNOT have been your intention. I’m now unable use countdown. Hi Simon, thanks for bringing this to our attention. We’ll have a look at performance on non 3G network. Yesterday predictions were counting down but buses weren’t appearing. Whats the point in having a product that doesn’t give the correct information? Hi Francis, we are working on an improvement which would add disruptions information to the new favourites panel. In the meanwhile, you can get disruptions information from the Status Updates page or bus stop/route pages. Does this mean that the Android app won’t work any more? I second the comments about needing a very simple interface which shows only the essential information and loads very quickly even when the mobile signal is weak. Hi Andrew, these changes wouldn’t affect any android apps that you use. Sadly Android apps like Bus Countdown have been affected and have ceased to function today (redirects to the website). If anyone knows of apps which are continuing to work, I’d been keen to hear about them! As others have said above, the original service was functional, concise and simple. I loved it. The new pages are bloated. You have scroll down to get to the actual bus times. If you filter the results by selecting a bus number, you have to wait for new data to come back from the server – the filtering should be client side (on the phone). I understand why you want to close the old service down but please provide us with the same lightweight, fast loading pages on the new site. I am sorry, the pages may be good for tourists but it does look as if the new pages have been designed someone who does not regularly use any buses. On positive point is that it shows live updates but I would still prefer to manually refresh the old simple pages. That way my data use and battery use are minimised. A couple more observations on the favourites function. 1. Why have TfL chosen to list departures by route and destination in the Favourites listing rather than in departure order? Listings on old Countdown and on the Stations & Stops page are shown in departure order but you’ve not adopted that. This means you have to scan across several routes at busy stops to see which bus is coming first rather than just looking at the top of the list. Worse you seem to have deployed a logic that if there are buses on one route but with different destinations these are shown on different lines in the listing – I saw this for route W15 where you split out a bus turning short at Winns Ave from those going to Higham Hill (Cogan Av). This just means you have to assimilate more info and then mix it back in to the other data to try to understand the sequence buses will arrive in. This listing sequence seems counter intuitive to how people use the bus network – often you can choose more than one route to get to a destination so you just want whatever comes first. If you only want a specific route then the option to easily filter the listing would be good (as on the old site) but it seem you are going to force people through the relevant Stations and Stops page and then ask them to filter info there. So two more selections and two more pages to load. Dearie me. 2. When you add a stop to your favourites list you have to select each route individually. In old Countdown there was a “select all” option as well as a filter. Why have you not provided a “select all” facility? As a trial I added a stop at Marble Arch to my Favourites – the page actually froze and I had to quit the webpage and restart it. This was using a laptop and the wifi speed was perfectly satisfactory. This is very poor and shows your deployment is not very effective when the old site did this without effort. I have just changed over my PC and smartphone to use the new My Buses rather than Countdown. On the Countdown site I was able to arrange and rearrange the order in which the stops could be viewed. I was able to list the stops in the order in which I most frequently used them. However, this facility does not appear to be available now. On my PC the stops are shown in quite a random order, because on a number of occasions the stop details did not save correctly. It would be most useful to be able to amend the order in which the stops can be viewed as I had before. Following this experience I added stops to my smartphone and then checked “view” after each stop load. Hi James, would surely consider this feedback as part of future improvements. I have tried using the tfl website too & I agree with all the previous comments. Also when I try to add to My Favourites it all locks up, even when I am using wifi connections. There was nothing wrong with the Countdown app, which contrary to your assurances I can no longer access on my android phone. What’s wrong with the theory of ‘If it ain’t broke – don’t fix it’? Echoing, once again, all that has been said above (re clutter, amount it needs to load + the ad which pushes everything down at the top), it’s such a shame to lose m.countdown which was simple and just had the info we needed. I’m not against the idea of a prettied up and auto-refreshing page, but removing a “light” (almost text only) alternative is a huge shame. Also, as I’ve been pointing out to different TfL departments for weeks, I’ve caught the new system displaying arrivals for closed stops in several different closure scenarios (and this is the data that apps use, too, so it’s bad news). ^ For comparison, results for the same stop last night just before the old system was removed. I couldn’t count the number of people I’ve see dashing down stairs at Turnham Green Tube in the last few days, as they check their phone for approaching buses. They run out, turn left, cross the road and see the bus approaching and passing them. Yes, there’s a “stop closed” hood on the bus stop itself, but you see the timings on the site/app before you reach there and you *trust* them. Using Countdown you can see the stop is closed (no predictions for arrivals are shown) so most people then know to turn right up to the next stop instead. Now, it’s a “known bug” according to someone at TfL who deals with app designers for live bus info, yet the working system was turned off before that was sorted. That’s aside from a bug where stop/line status alert flags are shown, but when you click there is nothing there. Not ready for primetime, really! I was a big fan of the old m.countdown.tfl.gov.uk site because it was simple and effective. I had my favourites (My Stops) setup and a shortcut to the site on my Android desktop. They new site is awfully cluttered and the loading times have increased substantially. I suspect this is because of the greater presence of images and colours and banners etc. I desperately request a cut down text based GUI version for us customers that preferred that version. Please. Hi Ali, Thanks for the feedback. We are working on making the pages lighter and also working on an option to have your buses arrivals on a lighter page. I can assure you’ll see the changes soon. I have a simple 3G phone, not a smartphone. I can get nextbus from mytraveline.mobi but cannot get anything loaded from tfl.gov.uk. I was quite happy with the system you closed down at the end of May. Publicly TfL boasts of its help for the environment and the poor so it seems inappropriate to make people buy new phones using the world’s limited resources when they have perfectly usable phones for calls, texts and (if it were not for the recent TfL change) for bus times. Such easy access to bus times encourages us to use your services and means a little less need for TfL to put up arrival boards. Simple text also reduces the processing requirements for TfL and users. The new website is extremely slow! On phones the layout isn’t as neat as the old app. I don’t like this change at all! As some stated above, tfl.gov.uk is poor fit for simply displaying live bus arrivals. I have added my stops to favorites, and 90% of the time all I need is live arrivals on those. But tfl home page contains loads of other useless links and pictures, which I never use in this scenario, and they slow page loading significantly – even on 4g! Very annoying. Have you thought of moving [mobile] countdown to dedicated, clean page? Did you try buses landing page? Your saved buses appear on this page as well and this page is less heavy to load. Hope that helps. The new bus website is inferior to the old one by a considerable margin. If that isn’t isn’t obvious then it means the people putting it together didn’t actually use the old one. Why couldn’t the functionality of the old site simply be replicated under a TFL wrapper? quite possibly the most unnecessary update ever, at the same time also excuding a whole realm of your customers from using it efficiently unless they have a very recent mobile. the m.countdown website was utterly simple, took no time at all to load, and reliable. one could search for postcode, rough location (i.e. East Croydon station), or bus stop. the new website can only look for bus stop. I have tried searching for my postcode and locations, in exactly the same format – and no results. I cannot understand why have you made such a move – could you not keep a stripped down version that actually worked? TfL is a public body and should be inclusive for all, not creating barriers for people due to their model of smartphone. The old site, provided a nice interface a round an API. It downloaded quickly and provided just the information required. I expect to abandon the TFL site and find an app that is fit for purpose. Missing the m.countdown site – safe much faster and simpler to use. Agree with all of you who prefer the old countdown, I really miss the “show stops near me” as this was fast and efficient, there is no substitute for this on the new site. This is the area that needs to be worked on as a priority. New site slow and cluttered and just doesn’t do what is needed. Hi Jenny, if you click on the ‘Maps’ button below the Journey Planner on TfL website homepage, you get an option of Nearby. Just give it a try and hopefully it would help you find the information. It’s bad enough that you’ve made the new Countdown less useful than the old (see above comments – particularly the ability to have a simple tool that works quickly at any random bus stop with potentially a poor signal – plus the brief appearance of a list of bus stops when I click “use my location” only to be replaced by a map with no list with bus stop symbols that only show the stop name when clicked, the fact that it seems to freeze my Windows 8.0 phone half the time, and so much more). What makes it worse is that at least on the route I use most (331) half the bus stops now either return an error message or claim no buses are expected within 30 minutes when the stops either side are showing a bus on the system that would arrive within that time. The old Countdown was pretty much perfect; please could you reinstate it until the replacement is fit for purpose, with all the previous functions as easy to access as they used to be? Then I might really believe that Every Journey Matters. I used to display the old Countdown bus data for several nearby stops on an information screen at our offices here, that runs a scripted (Chrome browser) carousel of information websites. I can find an add the stops and routes to the TfL Favourites, but I can’t manage to make it show the Favourites page automatically, without clicking on the ‘star’. Is there a way to make it display the bus/stop information automatically? Hi John, Did you try homepage? Not sure if you noticed, but your favourites appear on the homepage as well. Once you save your favourites, homepage of TfL website is personalised to show your saved favourites. Well, I’m glad I’m not the only one who can no longer use this on my older android phone, I have no way of finding out when the bus will come. It takes too long to load. I can’t add it to favourites. It really is less than useless. Sorry to be negative but add my views to all those others who like the way countdown worked.. Simple and straightforward , nothing else was needed. I just want to know when my bus arrives. Ok? The new bus arrivals facility is very disappointing. The old Live Bus Departures showed my bus stop instantly when I clicked it in the top bar. I have added my bus stop to ‘favourites’, still the new replacement bus arrivals screen requires 3 clicks and a scroll down. I do not want to do this when I am in a hurry. I am afraid I will miss buses clicking and scrolling around a website. I want the instant screen with my buses on it as it was before. Why is this no longer possible? Hi Poppy, if you bookmark homepage or add homepage shortcut to your homescreen, then you can get all the information by just one click. I am not sure if you noticed, but you also get live arrivals on the home page. Your TfL website homepage is personalised to show your saved choices. Finally I managed to add my 4 favourite stops near my house but I put one in by mistake and I can’t find a way to remove it.The old way was much easier. Hi Linda, you can just go to your favourites panel – check star at top right corner of the page and go on ‘Edit My Buses’. You can then click on the star to toggle it off and your bus stop would be removed from the list. Having used the TFL site for nearly a fortnight now I am still finding it hasn’t brought across any of the functionality benefits of Countdown. The move has taken a functional page (“i will tell you when the buses are due”) and tried to make it something else (“i will show you several banner images, a search function that doesn’t quite work, a map, more images, the first and last bus times etc. etc.”). If the place you’re in has a common name – e.g. ‘West Street’ – the search results show me a West Street in a different borough and no option of my actual bus stop, even with my location switched on. Sometimes, I’ll get the right area, but I will get the bus timetables for buses going in one direction, with no option to see or find the other direction (i.e. I’ll be standing at a stop that isn’t on the map). If I put in the 5-digit code listed at each bus stop rather than the stop name, I get an error page saying ‘Did you mean ‘X stop?’ (referring to the stop I’ve just put the code in for!). My main issue is that the site doesn’t really do its job. The auto-refresh is confusing because it doesn’t seem to systematically refresh, meaning it looks like buses go from being 4 minutes away to ‘due’ in seconds. The favourites function is also confusing as it seems to just stockpile all journeys at random, rather than my most frequently used stops (in mine, there’s a random place in North London I was at, but not the local bus stop I check daily!). The redirect in the interim period as Countdown was being phased out was immensely frustrating as it purposefully added a ‘please redirect me to TFL next time’ option and did not remember the preference to stay on Countdown – all this really seemed like our preferences weren’t important. It has affected third party iPhone apps, too in that information is not as up-to-date and seems to have the same refresh issue. However if you use the browser, you automatically have to use more mobile data to load images, links, unnecessary timetables, etc. so you can’t win. Please create a plain text version as with the former ‘accessible’ site; this is one area of the site where design isn’t important – I just want to know when the bus is turning up. Overall the service has gone from Countdown (user-friendly, accessible, quick, doesn’t eat up much data) to TFL (slow, consumes data due to images and links, not user-friendly, not intuitive, poor functionality) and my opinion is that these are impacts from budget cuts handed back to us as the customer. Please reinstate the brilliant old system. I missing buses, losing my mind and generally despairing. I use buses every single day to get around London and used countdown al the time. It takes forever to use the website and I end up missing my bus. Did you test it with users like me? Hi, Sorry to know that you are having trouble using the favourites functionality. If there any specific scenario that you can refer, which didn’t work well for you? We are working on improvements and your feedback is important. The mobile countdown application was excellent. The current offering is absolute rubbish on a mobile. If it did you would have tested the changes and found that there was a mass of work to do before making the switch. It would have taken one person five minutes to find out what an appalling experience users of the Mobile Countdown app were about to enjoy. Please put a refresh button on the page. When viewed on a mobile, I don’t see the page showing the time that the data relates to. I wouldn’t need to refresh the page if I could see the time, I could just do some simple maths. When using the search facility the phones keyboard covers up the fact that you can choose from recently searched stops. Adding favourites is too complex and horribly slow. I found it extremely frustrating. The fact that you need to have instructions here on how to do it shows that. It needs simplification. There is just too much rubbish on the page. I want to quickly see when my bus is coming. I don’t want to download maps and ads. Since my data limit is low, I expect I will see my data usage increase greatly this month as checking for buses is the most common thing I use my data for. Hi Julian, really helpful feedback. Let me answer your questions one by one. – Refresh Option: If that makes you happier, we are already looking into refresh options. – Time: Time is not shown for your saved favourites, as you can see the due times changing when the data is pushed. But, its an interesting feedback and would surely look into it. – Search: Through this feedback, I guess that you are using iPhone. We know this is an existing defect and we are trying to resolve it. – Adding favourites: Is there any specific scenario you can refer which didn’t work well for you? – Page loading: Your saved favourites appear on your homepage as well. So if you directly open the homepage, the maps won’t load and you can get live arrivals. I use a Samsung Galaxy S3 mini (old but reliable), so it’s not just an iPhone problem. When adding favourites you have to go through to many screens. The old countdown page allowed you to just click “add to favourites”. Once you do get to the screen to add the favourite, there is no indication that the favourite has been added, except a tiny pop-up that may or may not float up from the bottom of the screen, depending on your connection. Sometimes I go to my home page and only 3 of my 4 favourite stops are showing. Inevitably it is the stop I am wanting information for that is not showing. Bus times on the favourites page often seem to differ wildly from those on the page for the actual stop. Bus times are often inaccurate – I went out on Sunday and went to my local bus stop. The web page from my PC at home and on my phone both said no bus was due in the next 30 minutes. However I knew one was due on the schedule. I got to the bus stop, checked my phone, no buses due. I walked to the next bus stop (5 minutes), checked my phone, no buses due. I walked to the next bus stop, (5 minutes), checked my phone. Suddenly a bus had appeared out of thin air and was 1 minute away. Hi Julian, Thanks for your feedback. We are trying to justify user journey as close to the old countdown website. It would be helpful to understand specific issues you face that let you go through multiple screens. On the other feedback provided by you, it shouldn’t happen and all bus stops you’ve saved should appear at all times. Also, bus times shown for your saved favourites should be same as on the bus stop pages. It would be helpful to get specific example if you have, so that we can investigate. Hi Abdul, as mentioned in my post, while we can’t get the old website back, but we can definitely improve the the existing one. We are going through all the feedback and are working on improvements. There are new improvements coming soon and hopefully these will make your experience better. Why change to a new version before you get it working correctly? I find it really difficult to navigate – it was straightforward before. Why complicate things with rubbish you don’t need and leave out items you do need? I can’t find a refresh button to update time of buses either. When I pressed the opposite direction button it didn’t work! Useless site now! Hi Ann, we do not have a refresh button as the page refreshes automatically. What you see is the live arrival times. My complaint is that bus arrivals information is no longer working with a text service, yet bus stops still have identification numbers and invite passengers to text 87287. Why? I have a fairly old mobile but don’t want to change it as it is very compact. The text service used to work perfectly, with an instant reply. Recently I’ve tried to use it several times but have no reply whatever, not even to say that the service has been terminated. This means I have been charged for useless texts. What is the status of the text service now? Hi Kevin, SMS service does work. You can also search for SMS code directly from buses search on our website. It would take you directly to the bus stop page with live arrivals. There does not seem to be anyone who likes the new website on mobiles. I’m not surprised, as it’s so slow and uses so much data compared with m.countdown. Another problem that has not been mentioned is how slow it is to select by bus stop code. Enter the number, wait for the possible options to load and then select the one you want. Since a valid stop number has only one option it should be auto-selected; only show options where there is a choice! Previously it was very easy to select by bus number or stop number. There is one good aspect to the new design: when showing bus arrival times, the favourites section shows the arrival times grouped together, rather than using a new row for each bus. We recently went live with some improvements that would allow you to favourite your stops from the bus route pages. Try searching for a bus number and you’ll get functionality to add favourites from the bus route page. Hope that helps. Pretty terrible change. The previous countdown site was fast, uncluttered, and worked on all my devices. This new one is slow, confusing and hard to navigate due to many confusing options, and doesn’t work on my phone. How can I check bus times when I’m waiting for my bus now? I’m all for cost savings, but can’t you make something uncluttered and fast that works on all devices (like the old countdown) and uses the same systems as the main website? Hi James, Thanks for your feedback. Is there a specific problem you are having and if you could provide us with details please? Nice website but it doesn’t give the correct count down when taking a bus from start of the route. The old site used to give me to count downs for my bus stop which at the start of the route. One was for bus arriving (destination was the bus stop name) and one for departure (destination was the last bus stop on the route). The new count down for my bus so carries only one count down and appears to be for when the bus arrives. Hi Abdi, we know about this issue and are working on the fixes. It should be fixed by early August. I would be doing another post with all the improvements that went live by then. Keep watching this space for the same. Hope that helps. lets face it ‘ you took a good website and you messed it up ‘ – why ? why ? why ? as for trying to work out ‘ heading to Enfield ‘ I just don’t know when one will be due as it keeps claiming no buses in the next 30 minuets in either direction. Hi Brian, please let us know the stop name if any or did you use nearby before? Being awkward I use a Windows phone. The countdown app was easy to use and intuitive. Having to access via the TFL web site is neither. It is not convenient and is a major backwards step. Hi Kevin, Thanks for the feedback. I’ll pass your feedback to our testing team and get the performance checked on the windows phone. I would echo many of the comments made above. I am afraid I have to agree that the new site is rubbish, particularly when using from mobile devices. As it so happens, that will most typically be when one is out and about and trying to catch a bus! You used to have a good text only version but now there is only a single site and it is completely crammed with irrelevant graphics. I have literally missed buses because I was standing somewhere waiting for the page to load rather than already having the information and being able to make my way to the bus stop. You really need to re-develop mobile and accessible versions of the webpage. Thank you. Hi Stephen, we are improving the home page loading, but in the meanwhile you can access you can access your arrival times on the buses landing page. This page has less graphics and loads quickly. Yes, the buses landing page is an improvement, but it still has plenty of graphics and certainly isn’t quick to load! Looking at the full webpage, I’m beginning to understand why I’ve almost exceeded my data limit for the last two months – the TFL website is constantly pushing graphic-heavy adverts to my phone which I never even see! The initial buses landing page, before my favourite buses load, shows the TFL ad with the coffee cup ‘Find out when your bus is due with our bus arrivals service’. Yes, that’s what I’ve clicked on – I don’t need to see an advert for it! This moves further down the screen as the buses begin to show, but is still there. Further down, below various links, is another TFL ad asking if I want bus arrival information on my organisation’s premises? No, I’m walking towards a bus stop and I want to see when the next bus is due! Right at the bottom (I wouldn’t normally scroll down this far) is a picture of 2 in 1 Bold, helpfully labelled ‘Advertisement’. These three pictures all appear when I open the website, but I have to wait for bus information. If I don’t close the website down completely, they continue to refresh indefinitely, draining my battery and using my data. In addition, as Julian points out, if you have more than 3 or 4 favourite stops, there’s not enough space allocated for them on the initial page – you have to click on ‘view all’ and wait for another page to load. This ‘My Buses’ page just contains all the favourite buses, and is much more useful – but you can only reach it from the home screen, wasting more time. If ‘My Buses’ could be bookmarked in the same way as the buses landing page, it would be much closer to the old Countdown – add a ‘Find a bus’ search box at the bottom and you’re nearly there! I’d also echo Newmo’s comment about auto-selecting a bus stop code when that’s unambiguous. Hi thanks for this post and for listening to feedback. I miss the old site but understand the reasons for change. The new site is prettier, but it loses out in quick access. Countdown showed my favourite stops in one short list so it was very quick to see the stop I wanted. It was also quick to search for a new stop. With the new site, whilst I can save favourites, those favourites show the stop followed by all the routes. This means I can’t see all my favourite stops without lots of scrolling. I also can’t save a bookmark to all my favourites, I have to load the page then click on the star which hovers my favourites into view. Could you make it possible to see the list of favourite stops on the homepage without listing routes? That way I can save one bookmark that shows my stops in a shirt list. Currently I now have 7 bookmarked pages where I used to have 1. Would like to understand a bit in detail. Our website do show favourite stops in one list: Did you try saving them? Also, what specific issues you are having to search the buses? We recently added an improvement where you can save your bus stops from routes pages. Try searching for a route and you get an easy way to save your favourites. Is that something you were missing? We introduced bus stop-route combination as user research suggested that customers are interested in saving a route from particular stop, instead of just a stop. But great to hear your thoughts on the same. Also, you do get your favourites listed on the home page and on the buses landing page, so you don’t need to click on the star to access them. In that ways you can bookmark either of the page and get live arrivals on the go. Hope this helps. 1) Whilst favourite stops are shown in one list, they include bus details. So as I have half a dozen favourite stops, I need to scroll quite a lot to find some of those stops in that list. The quick access has completely disappeared. 2) The buses landing page only shows the first couple of favourites (and with bus details). There is a ‘view all’ button, but this just links to the longer list of favourites with all that bus detail, so exactly the same problem as above: i have to scroll excessively to find the stop I want. But aside from scrolling, I need to click twice to see all my favourites. If you had a page that genuinely showed all the favourite stops that would at least address one of my concerns, even if this list had the bus details. It’s hard to explain this in writing, and clearly you didn’t understand my first attempt, so the easiest thing is to say that the text only version was much quicker (one click to access a quick-loading page that showed all favourites in a list that could be seen at a glance with no scrolling). I agree with Stephen Hsu’s comments here. And thanks to palfret for building that replacement site – I haven’t had a full play yet but this looks interesting. Hi Palfret, All the best! Great bit of work, love the simplicity. It’s what we’re all missing. One comment/feedback if i may..? Regarding the favourites; where you have two bus stops with the same name, is there a change you could make to differentiate (between the two identically named bus stops) in the favourites view? E.g. when you search for Ripon Way you get two results (one for each bus stop), but no way to differentiate which is the New Barnet bound and which is the Edgware bound. Both are for the 107 route, just opposite directions. Hope that makes sense, if not, feel free to contact me and i can try to explain better. And again, what you’ve put together is a real time saver and an efficient bit of coding. Thanks! Hi Ali, Glad to hear that you appreciate our efforts and found it useful 🙂 Thanks a ton for the encouragement! On the Ripon Way, looks like data issue. If there are two bus stops with the same name, it does show the direction. Try searching ‘Museum of London’ and you’ll understand what I mean. In the meanwhile I’ll get Ripon Way fixed. My post was more in response to Palfret and the sleek site he/she has created. There clearly is a demand for a completely stripped down site, no bells, no whistles; just live bus arrival times. However, good work on receiving user feedback and making any changes as a result. It’s important to all of us that we are heard and have input into a system we all use. Sorry to say that I’ve abandoned TfL’s new Countdown page for all of the reasons mentioned above. I have installed the FREE app Bus Countdown (red/white logo of a watch with a bus on it – brilliant!) on my PC, tablet and phone and all three work perfectly. In fact it us even better than the old TfL Countdown as it acts in real time, so no need to refresh. And it’s instant. Hi Vic, we are sad to loose you as a customer, but hope to win you back. It would be great to know your suggestions as we have future improvements planned. Just a note that bus times on our website are live and you do not need to refresh. Happy for you to use the app of your choice as we fully support open data community. Vic – I’d be interested to try the “app Bus Countdown (red/white logo of a watch with a bus on it ” – but I can’t find it ! A clue or two would be appreciated. It’s called London Bus Live Countdown and the logo is a red square with a white wristwatch with a red London bus horizontally in the middle. It’s fantastic, I have it on my iPad and also on my Samsung android phone (link below is for via Apple only but if you don’t have an iPhone, just type London bus live countdown and you can download the app and start using it straightaway. Vic – many thanks for the info. Still missing buses,or waiting for a long time,at bus stops because I cannot get instant bus times anyo more. I don’t think you appreciate how frustrating this is. I had the perfect solution that was customer focused and really useful. I now have something that feels like it is the opposite. It takes five minutes plus to get simple information. Depressing. Hi, sorry to hear that you are not getting the information that you expect. But, it would be really helpful if you could let us know specifics of issue you face. We can then have a look at our end. I have tried a couple of times to post this, but your site doesn’t want me to reply to your reply. So I am trying again, but posting as a new comment. To be clear, my original post was JULY 11, 2016 AT 10:32 PM. – yes I can save favourites on the new site, I clearly state that in my original post. – I’m not sure I mentioned having problems searching for buses? – Your comment about not need to click on the star is irrelevant. You have the choice to click on the star (requiring a 2nd click) or click on the show-all (also requiring a 2nd click). Same thing really. Same problem. Same step backwards in user experience. It’s hard to explain in writing, but I hope it’s suffice to say the old text based site was simple, quick to load and presented all my favourite stops in a single list that was visible on a phone’s screen without scrolling. The page was accessed by one click, so I was able to save a link to the site on my phone’s home screen and simply had to click that to see my stops. – the full list of favourites is not available from any directly-accessible page. What I mean is, I know there is the buses landing page that you link to, but that only shows the first 2 favourite stops. To see the full list you have to click on show-all. So, to see the full list of favourites I have to open a slow-loading page, then scroll down, then click on show-all, then wait for the next page to load, then scroll down to the stop I want (unless it’s the first one), and sometimes having to scroll up and down until the stop is found. Really poor experience. With the old site I simply had to click on the link I’d saved on my phone. Fair enough if you’ve had feedback that people want to be able to save favourite route-stop combinations, but what you’ve provided gives way way more than that and has complicated the whole experience. At the same time as providing that new functionality, you’ve removed the basic ability to quickly access the full list of favourite sites on one page (without the need to scroll, or click on 2nd pages). I can’t see why you couldn’t meet the request for route-stops using the old text based site by either showing them in a separate favourite list (so people could choose favourite stops or favourite route-stops) or to combine the two into one list. I get why you had to retire the old text site, but there’s no reason at all why you can’t have similar functionality as was available on that old site on this new one. I have previously commented on this item and have recently received a large number of comment downloads about it, almost all of which are negative. I have tried to learn to live with the new facility but am still struggling, and so thought it appropriate to summarise the difficulties that I have encountered: I use it both on my PC and also on my smartphone. 1. Speed of use. The whole thing is far too clunky, with a high graphics content that is simply not required. The aim of the facility is surely to quickly and accurately give specific information rather than the advertorial, with its high graphic content, that currently gets in the way. This slows the whole thing down. Simplicity, rather than trying to show too much, is best. 2. Clarity. The previous offer was clear, with a sensible, legible layout. The information, when it finally arrives, is not straightforward to distinguish as the colours and spacing used. To have all of the text, stop names, bus numbers and arrival times, all in the same white on black in the same font, does not make it easy for quick reading. Much of the use made of the facility is at bus stops that do not have Countdown displays. Despite the London Buses Red Book requiring drivers to stop at all stops where there are passengers it does not happen in practice, and it is necessary to make quite obvious to drivers at stops served by a number of routes when you wish to get on their bus, even if it is no longer required to hail by outstretching an arm. 3. Ease of setting up. I first had to set up my choice of routes and stops on my PC. I do wonder how many “people ion the street” were used to road test this before it was launched, I certainly have not been aware of any public beta test. For convenience I like to have the stops listed in a particular order. When I was originally setting up the layout and terminology used, together with the very slow speed of response, meant that some of the stops are in a different order. Under Countdown that did not matter as I could simply drag and drop the stops into the desired order, a feature,as I have mentioned above, that would be most useful. In order to change the order it seemed as if I would have to delete everything and start again. However, I have discovered that whilst this was possible for those stops for which I had selected only one route it would not allow me to delete stops with multiple routes, despite having unstarred all routes. The result is that I am still stuck with a display that is not in a convenient order and thus takes longer to read. Although I learnt the lesson about order when setting up my smartphone and have that in the order I currently want it would seem to be a very fiddly process if I want to change anything. 4. Display. I can see from above there are some who like the listing of next buses by route I find the previous departure listing preferable. From some of my selected stops I have a choice of routes. Some will take me part of the way I wish to go, and one will take me all of the way. To have to read through all of the routes, particularly taking in the clarity I mention above, is not something that can be done quickly. If you have support for both types of display then would it be possible to make both available? I hope that my comments are seen as constructive and not a moan. There are doubtless many users that are not aware of this blog or other lines of communication who are struggling, or may have just given up (I have met a number). In the current financial climate within TfL it is surely best to work on something providing best value, even if simpler than that for which there are aspirations, and so provide bus passengers with an efficient and timely source of information. I’m sorry but the TFL website is awful – it’s so slow that the download is invariably aborted by the server due to timeout. The old system by comparison was marvellous ! The new website uses up a horrific amount of data. Will that be fixed? I’ve never commented on things like this in the past – but this change is so retrograde that it is infuriating. The ‘stock’ answer to problems people are raising with using this site is to ‘add it to your favourites’. If, like me, you work in an organisation that ‘deletes’ all such history day after day – this simply doesn’t work. Countdown used to work fine – just had the information you wanted. Now I have to find the page – very difficult in itself (despite google searching etc). Then you have to scroll past loads of pointless information (eg map) – then click on the buses for another drop down. All very very time consuming and NOT conducive to getting a bus quickly. Please can you just try to revert to the old countdown system (or something much closer to it). I also know that my parents in-law (elderly) have similar complaints about this change – but are even less likely to ‘complain’ on a site like this. ‘Favourites’ has disappeared from your app on the last update 31/07/16 and my stops were not migrated to ‘My Buses’. RU gonna fix this? Can you give solution? Hi, why is the new Countdown not showing any bus disruption information and stop closures like the previous one? Hi Elizabeth, You can search for SMS code directly from buses search. It would take you directly to the bus stop page with live arrivals. I appreciate people are working hard on this, but searching on the new site is still very cumbersome and counter-intuitive – could the new site please be made to work with the 5-digit bus codes? If I type those in, most of the time I get nothing relevant. Adding bus code support would be an easy painless way for people to reach the correct page. Also, typing in the stop name usually brings up junk results, maybe due to problems with multi-word searches? e.g. ‘Tollington Park’ – the search doesn’t seem to take into account the word ‘Tollington’ – it just searches for ‘park’. If I type in just ‘tollington’, I get more relevant results. If I type in ‘Warren Street’, the first result is ‘Cannon Street’! It’s searching by the word ‘street’. Mostly I have to type in the bus route – but this also is not flawless. On some routes (e.g. 29, 91) the first result is the relevant bus route. On others (e.g. W3, N91) the bus route doesn’t appear in results at all, and I end up having to look for other buses that use the same stop. Then, when I get to the list of stops on the bus route, the control to switch direction of travel is at the bottom of the list… Could you please add the ‘switch direction’ option at the top as well? One good thing, though, is the auto-refresh on the bus times (when you eventually get to the right page…). Hi Andy, thanks for your feedback. You can search for SMS code directly from buses search and it would land you to relevant bus stop page. Also, we have made improvements to routes pages and now you have switch direction button at the top. Hope that helps. 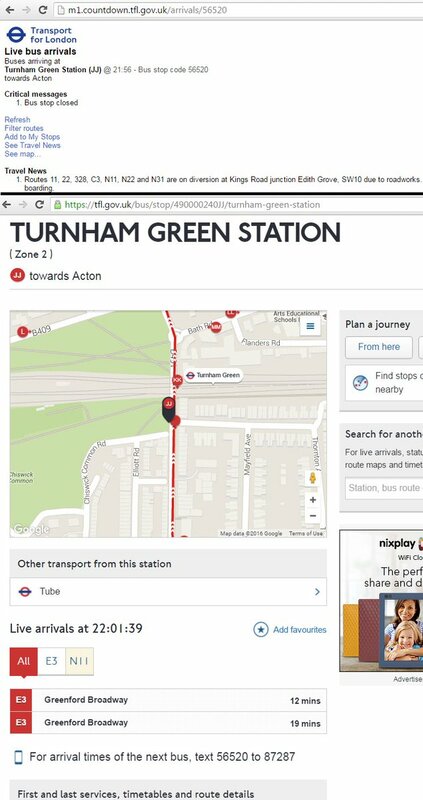 Thanks for getting back to me – it should be made clearer though (as I had to search around) that when you say “buses search” you mean a different page: https://tfl.gov.uk/modes/buses/ – where one search box on the right of the page is correctly configured for bus stop codes and multi-word names. Hi Andy, we are constantly improving and your feedback is really important. The top search box is for internal website search and that is the reason it doesn’t take codes. But yes, plan a journey search box is a good idea and we can have a look. In the meanwhile read – https://blog.tfl.gov.uk/2016/10/18/buses-improvements-responding-to-your-feedback/ to know about recent improvements that we’ve made to our website re Buses. I agree with the comments above, slow to load, too many clicks/swipes to get to your favourites and no instant refresh but I have to add that for the past 2 days my favourites won’t load unless I’m standing next to a bus stop. I just get an edit button. Any idea why? Since the changes my old app no longer works. I’ve now found this app London Live Bus Countdown by Mobicia. I would highly recommend it. Very easy to use. Looks like all the comments here agree with me: too much faff when you’re already standing in front of a bus stop and know which bus to take, and you just want to know how long. In my case, I want to use the 5 digit bus stop ID. No need for disambiguation, no need to search on a map. Countdown used to support this. It works fine for network rail for example: on that website i can enter 3 character station code and find the next train in one click. Hi Joshim, You can search for SMS code directly from buses search. We have made improvements and you would not see disambiguation page when searching for valid SMS code. Thank you for all your comments on this post. Unfortunately due to the volume of replies it hasn’t been possible to respond to every one individually. Though we identified common themes through the feedback received and have tried to address them. Please read my latest blog post (https://blog.tfl.gov.uk/2016/10/18/buses-improvements-responding-to-your-feedback/) which explains how we’ve responded to your feedback on our new buses tools. Please do leave a comment on that post as your feedback is really important. We will now be closing the comments on this post as new comments are directed to the new post, where they’re most relevant.